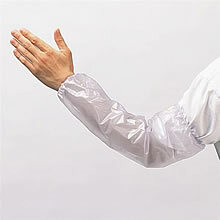 The protective Vinyl Sleeve for use in pet washes, grooming shops, vet clinics, light duty industrial, food processing, or laboratory work environment. Elastic on both ends ensures a secure fit. Sold in a set of 2 sleeves.